The new, old gin — The Old Town Alchemy Co.
Few things in life are finer than an afternoon drinking gin and sometimes we're lucky enough to spend that time with someone who shares that enthusiasm. Earlier this week, the Raconteur - most likely Edinburgh's next world-class cocktail bar - hosted Andy Dawson from Broker's Gin for a tasting/Q&A session. Despite launching in 1998, Broker's isn't a particularly well-known brand in the UK. Their initial focus was on the US market where they're now available in 40 states and have garnered a wealth of awards, including the top ranking in the Gin category at the 2010 Ultimate Spirits Challenge. Remarkably, Broker's is still an independent brand, operated by its founders Martin and Andy Dawson. It's always refreshing to see products flourishing outside of the major multi-nationals, and it's also impressive to see them putting the effort in to expand outside of London. Edinburgh was an obvious choice, apparently. It's believed to have the highest per capita consumption of gin of any city in Europe. There's something essentially English about Broker's. 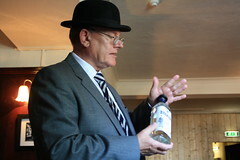 Each old school, square bottle wears a little bowler hat - as does Andy when he's on the clock - but that philosophy also extends to the contents of the bottle. It's unashamedly classic in style with juniper front and centre, complemented by rounded spice notes and sharpened with a touch of citrus. To put it in context, it's somewhere between Tanqueray's full-blooded robustness and the lighter flavours and textures of Bombay Sapphire. The botanical mix contains no non-traditional ingredients, which sets Broker's apart from the majority of new gins and it's difficult to fault that strategy. There may - and some might argue it already has - come a point when the addition of flavours like raspberry or coconut or whatever comes next becomes less about creating a great product and more about defining a brand gimmick. Broker's are supporting an imminent competition, to be held at the Raconteur in early July. The rules are pretty tough - four ingredient maximum, which must be easily available or replicable, and all recipes have to presented with a story as opposed to the traditional here-I-am-and-here's-what-I'm-doing approach. I'm not going to be able to compete, but if I were, I'd be hard pressed to find a more appropriate story than two guys with a dream that's still going strong a dozen years later. Stir the first three ingredients with ice and strain into a chilled flute. 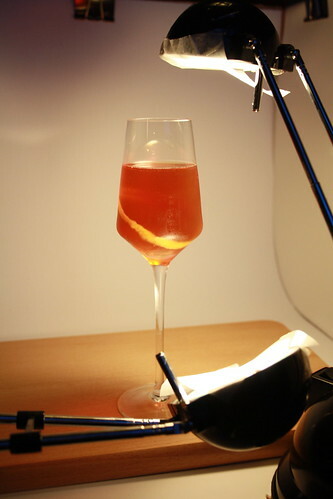 Top with Champagne - not too much - and garnish with a lemon zest twist. Posted on June 23, 2010 by Jon and filed under Mixology, Recipes and tagged bars Broker's Gin competitions gin the Raconteur training days.